ST. PETERSBURG, March 22. /TASS/. The State Hermitage Museum in Russia’s St. Petersburg has reopened after a bomb threat it received turned out to be hoax, the museum said in a statement on VKontakte. "Once visitors and staff had been evacuated from the Hermitage, security personnel and National Guard officers examined the Museum’s exhibition halls and offices. 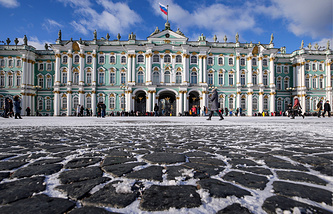 No suspicious items were found so the Hermitage has reopened," the statement reads. According to earlier reports, the Hermitage received a bomb threat, which prompted the evacuation of visitors and staff. St. Petersburg’s emergency services have been receiving bomb threats since mid-February. Evacuations took place at dozens of schools and higher education facilities across the city, as well as at numerous shopping malls. However, all threats proved to be fake.